Faeries in The Horror Zine! The May issue of The Horror Zine, edited by Jeani Rector, is now available online, and it contains my brand-new story “Faerie,” which may or may not contain a faerie. Beware, kids: this is a weird one. This issue also contains stories by James Marlow, Jeff Parsons, and Jayme K., poetry by the mighty Joe R. Lansdale, Ghia Vitale, Joseph V. Danoski, Jean Jone, and J. Michael Seals, and art by Jihane Mossalim, Stephen Cooney, and Lorraine Hall. Check it out (for free!) at http://www.thehorrorzine.com. It’s less than a month until the 2014 Bram Stoker Awards, and once again I’ll be Master of Ceremonies at the awards banquet. Will I continue my streak of having all of my jokes 100% done before I get on the plane? Preparation for this year is well underway, with the goal of having everything done by April 30th (I leave for Portland on May 6th) so I’m thinking “Yes.” Horror conventions are much more fun when you’re not locked in your hotel room frantically writing new material cursing your procrastination gene. So how many of YOU are going to the Bram Stoker Awards/World Horror Convention? And Even More Guest Blogs! Sinister Sister Speaks, wherein I babble about candy AND include a special sneak preview of Wolf Hunt 2! Tomorrow I’ll post the complete list, in case you missed any! On March 22nd and 23rd, I had the incredible thrill of being on the sunny beaches frozen tundra of Buffalo, New York to watch the filming of “Gave Up The Ghost,” a short film I wrote, which will be part of the horror anthology Creepers. This is the tale of that weekend. I’ve known of director Greg Lamberson since I saw his movie Slime City in 1988, a year in which pretty much every weekend was spent watching horror movies on VHS. (With friends. No girlfriends, but still, with friends.) I didn’t actually meet him until 2005, at the World Horror Convention, where we traded novels (his Personal Demons for my Mandibles…sucker! Mandibles is way shorter!) and quickly became friends. The Lambersons and the Strands even went to Disney World together, and ate alligator ribs. FLASH FORWARD to January 8th, 2014. Greg had never directed somebody else’s material before, but though he’s a prolific author, he writes almost exclusively novels. He needed a short story that he could adapt into a 16-23 minute film. I sent him a few possibilities, but I thought “Gave Up The Ghost” was the best bet, because a) it has a very small cast, b) it takes place almost entirely in one location, and c) it’s one of my favorites of my short stories. The only concern was that it might not QUITE fill 16 minutes of screen time. Greg got the green light, and I was turned loose to write the screenplay. It’s the story of a novelist whose computer dies, taking his ultimate masterpiece with it, and by adding a few extra jokes and short new scenes, I turned it into a 19-page script. Rod Durick II! The mighty cinematographer. Chris Gosgrave! The mighty sound guy (and also the editor). Chris Rados! The mighty lighting technician. Scotty Franklin! The mighty lighting technician’s assistant. Nicholas Anderson! The mighty assistant cameraman. Arick Szymecki! The mighty special effects makeup guy. And Sam Qualiana! The mighty assistant director. The day started by recording the voice-over narration by one of our lead actors, Drew Bialy, who plays the tragic, pretentious author whose magnum opus perishes in a computer crash. This narration is directly from the story, and it’s a story I’ve read out loud in front of an audience, so there were concerns that upon hearing my words spoken by a mouth that is not my own I’d bellow “My baby! You’re ruining my baby!” and drop into the fetal position. But, nope, both Drew and John Renna, who plays the computer repairman, are hilarious. Perfect comic timing. Greg then recorded some quick voice-over lines for a dream sequence, and my audio cameo of “Thank you very much!” will STUN and AMAZE you with how correctly I pronounced all four of the words. Because this film is called “Gave Up The Ghost,” you’ll be pleased to hear that it does indeed contain a ghost. 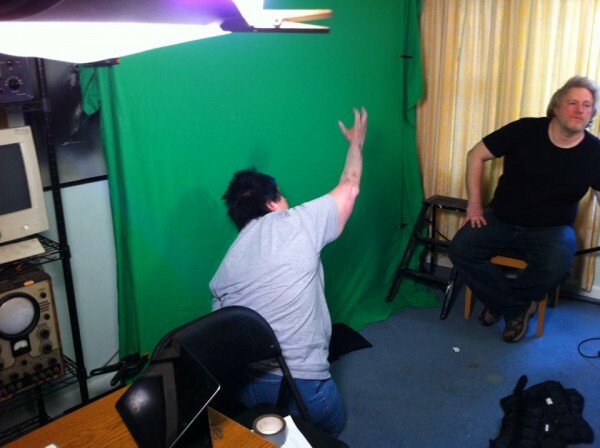 This particular ghost is played by Paul McGinnis, filmed against a green screen, which is way easier than making his real head float around without a body and be transparent and stuff. (Or so I’m told. I left the F/X decisions to the experts.) It’s a perfect melodramatic performance. The green screen was also used for demon hands, performed by Lynne Hansen, Tamar Lamberson, Kaelin Lamberson, and Arick, because what’s the point of having a green screen if you don’t use it for demon hands? The guy answering the phone at the computer repair place was played by Alexander Sloan McBryde. My favorite part of the filmmaking process is that I got to write “INT. COMPUTER REPAIR SHOP – DAY” and it was up to somebody else to actually get the desk, shelf, phone, and several old computers, along with some ancient pieces of electronic equipment that you probably won’t be able to see in the finished film but which are pretty funny. Unfortunately, I also wrote “EXT” in one part of the script, which was stupid, because this was filmed in Buffalo. Technically, it was Spring, but apparently nobody told the earth’s axis. Through the magic of logo design and a large decal, we had our “SCM Computer Repair” car, which I was not allowed to take home as a souvenir. The movie’s several dolly shots were done using PVC pipe as the track, and a base with angled wheels so the camera could roll smoothly. Dolly rides were not made available for the crew. Though Greg chose a simple visual style that wouldn’t distract from the actor’s performances, there’s a cool “computer POV” shot. John Renna’s first appearance is a lengthy camera tilt (which, like a FOOL, I described as a “pan” in the script. “Tilt” is up and down. “Pan” is left and right. Duh.) that was done exactly to my specifications…but the joke doesn’t really work and will probably be cut. My bad. To get the script to the necessary length, I’d added an extremely pretentious scene from Drew’s novel (“Life…is like a glass swan.” “Indeed.”). As John offers helpful suggestions for other kinds of books Drew could write, we revisit the scene several more times, turning “Gave Up The Ghost” into a zombie, vampire, cannibal, mummy, AND Sasquatch movie. Sam Qualiana ditched his assistant director duties for the day and joined Jessica Zwolak for these scenes. They’d film a scene, then head back upstairs for costume and makeup changes. For the cannibal scene, makeup guy Arick Szymecki brought plenty of props, and was also kind enough to attach some lunch meat to the severed heads that our lucky actors got to gnaw upon. Did Jessica mean it when she delivered the line “Mmmm…good neck!” or is she just a brilliant actress? 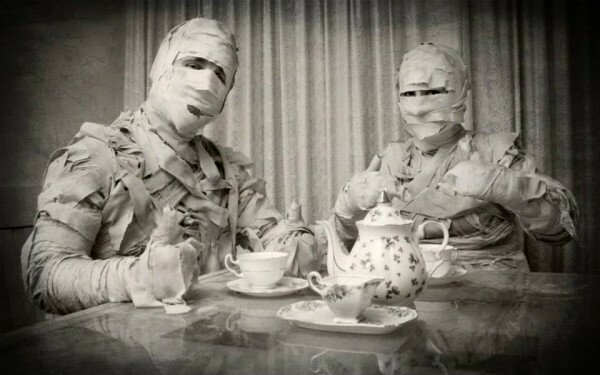 In-between shooting the tea parties, the rest of the days’ filming was pretty much the Drew & John Show. (Paul’s actual role had been completed the day before, but he was there to deliver his lines while they filmed the other side of the climactic author/computer repairman/ghost confrontation.) As a writer, there is no greater thrill than to hear lines of dialogue that you’ve written spoken by actors…again…and again…and again…and again…and again…and now from this angle…and again…and again…and how can this joke be funny after everybody on the crew has heard it so many times I need to do a rewrite AAARGGH!!! And I got to go to Duff’s for some genuine Buffalo wings, which, ultimately, was the reason for the trip. 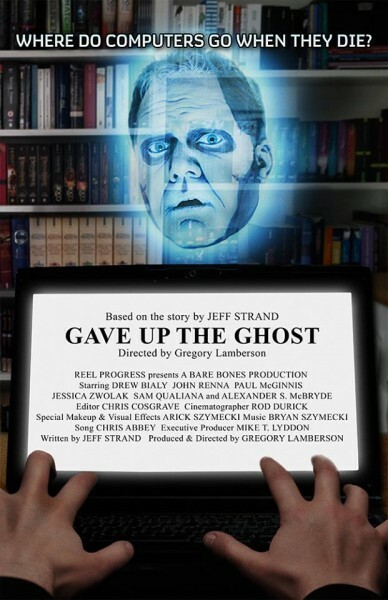 When will YOU get to see “Gave Up The Ghost?” Stay tuned to this very website for updates, or also check out Greg Lamberson’s website, the official Creepers website, or the IMDB page.